The fact that he was on the cover speaks to his national prominence, influence and significance as a leader in the Black liberation movement here in the United States. It also in many ways signaled the beginning of the end for him as a nationally respected Black leader. The article that accompanies it details his dealings with Uganda's president, Idi Amin, and Innis' attempts to forge international alliances. His trying to cast himself as a descendant of Marcus Garvey's political philosophy only backfired on him as his forays into dealings on the African continent led to him being branded an agent for the Central Intelligence Agency by several African, African American leaders and American journalists. 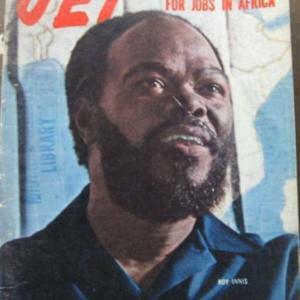 “CORE chairman Roy Innis on the cover of Jet Magazine,” corenyc.org, accessed April 22, 2019, http://corenyc.org/omeka/items/show/310.